National Coffee with a Cop Day is Wednesday, October 3, 2018. Let's Talk Over a Cup of Coffee! On October 3, 2018, officers from law enforcement agencies in all 50 states and five foreign countries will participate in Coffee with a Cop, and we encourage you to join us. 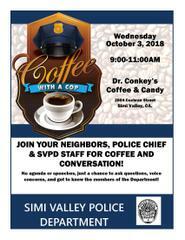 The Hawthorne Police Department hosted the first Coffee with a Cop in 2011, as part of its effort to enable meaningful conversations with community residents. It’s a simple concept. Police and community members come together in an informal, neutral space to discuss community issues, build relationships, and drink coffee. One of the keys to Coffee with a Cop’s success is that it removes the physical barriers and crisis situations that routinely define interactions between law enforcement officials and community members. Instead it allows for relaxed, informal one-on-one interactions in a friendly atmosphere. This informal contact increases trust in police officers as individuals which is foundation to building partnerships and engaging in community problem solving. Date and Time: Wednesday, October 3, 2018 from 9:00 to 11:00 A.M. Location: Dr. Conkey's, 2804 Cochran Street, Simi Valley, CA.